Besides the traditional mosques there are outdoor mosques for holiday prayers, and a large number of believers. One of these mosques is located in the south of Bukhara. Now it does not work, because long ago it has entered the city boundaries and is surrounded by residential communities. 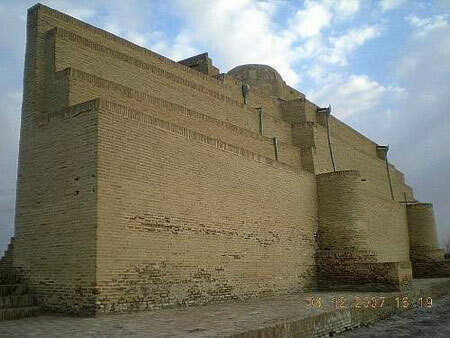 It appeared in the IX century, during the spread of Islam in Central Asia, and remained part of the building was originally built as far back as in 1119 and subsequently was modernized in the XIII and XV centuries. Consisting of the huge brick wall with length of 38 meters it had a special niche - the mihrab, by which the faithful orientated to Mecca. In the XVII century the mosque was again rebuilt and acquired the shape of aivan with three portals. Today, the Namazgokh mosque became the tourist monument of Bukhara, and other mosques fulfill the functions of country prayer places, but visiting this sight, it is worth just to imagine how many people gathered at the same time on Muslim holidays, that to appreciate its importance in the life of the city.